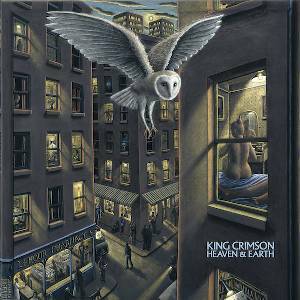 Heaven and Earth is the most comprehensive boxed set in the series to date, covering just over a decade in King Crimson’s extensive history. It presents the most complete account of the ProjeKcts series with concerts by P1 – 4 & the sole studio recording of P2 in addition to a huge selection of ProjeKct albums and related recordings. When the Double Trio line of Fripp, Belew, Levin, Mastelotto, Bruford, and Gunn wanted to develop new material at the end of the THRAK-era in 1997 they broke down into smaller groups, a process which Fripp dubbed fraKctalisation. Four CDs and two Blu-rays detail this risk-taking era in comprehensive detail. When the individual players regrouped as King Crimson the band was now a double duo consisting of Belew, Fripp, Gunn, and Mastelotto with Tony Levin & Bill Bruford leaving to fulfill other recording and touring commitments. The next period of KC activity resulted in two studio albums, a heavy touring schedule, a studio mini-album & a number of live releases on CD/DVD/download & ran to 2003. The two studio albums are presented here for the first time in 5.1 surround mixes. 2000’s The ConstruKction of Light has undergone the most radical change of all KC albums thus far. The loss of the original recordings of the electronic drums allowed Pat Mastelotto to completely rerecord the material on his current acoustic/electric kit making for a virtually completely new album of familiar material. 2003’s The Power to Believe has also benefited from additional sonic seasonings from the original recording sessions discovered by mixer/producer David Singleton & woven into the surround mix. They are accompanied by a series of live recordings presented across 11 CDs of live recordings taken from the various tours including a US show with Tool and a specially construKcted 3CD set from 2000 which interweaves improvs & the London concert to produce a very different, very powerful imaginary KC set-list. Every night of the 2000 European tour was also filmed in DGM off-shoot company, Bootleg TV style. This had the advantage that the crew filming became equally familiar with the set-lists, for example knowing when to get closer to particular musicians at key points, working out how best to film the improv sections and going with the flow of the gigs. Most live concert films are precisely that: a film of a single performance or a couple of nights at a single venue. With Bootleg TV, filming evolved to match the band and this Blu-Ray details a very different approach to live filming, with nearly ten hours of live video footage as proof of concept. It's also just one example of why, at one point it was thought that this era would have to run across two boxed sets but by utilizing the full capacity of every disc included the entire history of the band in this era is presented, as it should be, in one place. With King Crimson again off the road, in 2006 Adrian Belew and Robert Fripp became ProjeKct 6 and four of their concerts feature on Blu-Ray Disc 2. Finally, CDs 17 and 18 present an idealized set-list drawn from the New York run of gigs from King Crimson’s 2008 US tour which saw the band playing live after an absence of five years. Following Trey Gunn’s departure, Tony Levin rejoined the band, and, with drummer Gavin Harrison making his debut with King Crimson, both he and Pat Mastelotto foreshadow the elements that would make the three drummer set-up of the present-day incarnation of King Crimson so spectacular. Eleven years, numerous ProjeKcts, dozens of concerts, complete studio recordings of the era, with re-recordings in new stereo & 5.1, and over 10 hours of live video footage, Heaven and Earth is the most extensive account of this part of King Crimson’s ongoing story. •	The complete 1997-2008 King Crimson boxed set: 18CDS/4Blu-Rays/2DVD-a. •	3CDs feature a re-imagining of The ConstruKction of Light, an extended/enhanced stereo mix of The Power to Believe and the (studio) Happy With What You Have to be Happy With & (live) Level 5 mini-albums. •	4CDs feature ProjeKcts 1 - 4 (new to CD) with 1 CD allocated to each line-up. •	11CDs feature live recordings (several new to CD with some material previously unreleased in any format) from the 2000, 2001, 2003 & 2008 tours. •	Disc Three contains The ReconstruKction of Light – The album in new stereo & 5.1 mixes with the drums completely newly recorded by Pat Mastelotto – stereo mixes by Don Gunn, 5.1 mixes by David Singleton + the original album in hi-res stereo, The Power to Believe – expanded/enhanced 2019 master (2 tracks with additional elements + 3 extra tracks assembled/mixed by David Singleton) & 5.1 surround mixes by David Singleton – all mixes approved by Executive Producer Robert Fripp + bonus inclusions of Happy With/Level 5 mini-albums, the 2000 show from London & the EleKtriK live album from 2003 + video of a tour of the KC studio/live equipment setup from 2002. •	This is the seventh boxed set in a series of editions which will, when complete, cover all periods of King Crimson activity from 1969 to the present era. Frequent Fliers automatically receive a free King Crimson 50th Anniversary Collectable pin with their Heaven & Earth boxed set order. For details on becoming a Frequent Flier, our free loyalty program, please inquire at orders@schizoidshop.com.